Moses Godfrey was my 7th great grandfather. He was born Jan 27, 1667 in Barnstable County, Massachusetts. He married Deborah Cooke about 1700. He died on April 16, 1743 in Barnstable County, Massachusetts. The will was written in Feb 1741/1742. Item I give and bequeath unto my seven sons as namely Samuel, Moses, David, George, Benjamin, Joshua and Richard my housing lands meddows and moveables both within Docy and without they paying and allesing out the whole the legacy hereafter allowed to each person prescribed. Viz. Item I give and bequeath unto Deborah the wife of Thomas Bassett what she hath already and twenty five pounds in moveable or acquired. Item I give and bequeath unto my daughter Elizabeth wife unto Benjamin Bearse worth of what she hath already had twenty five pounds moveable or acquired. Elliott Hamilton Stewart arrived in New York City December 21, 1888 at the age of 22. Almost immediately he headed to Utica, NY. He had studied law at Queens College in Ireland and quickly found employment as a clerk in the Assessors Office at Utica City Hall. While competent at his job, his passion was music and singing. Elliot H. Stewart was born in Belfast, Ireland on May 22, 1866 to James Stewart and Martha Elliott Stewart. It appears that Elliott was the baby of the family. His known brother's and sister were: William C (who moved to Utica), Thomas (who lived and died in Belfast, but spent about 1 or 2 years living in Utica), James T (lived his entire life in Belfast), Bessie (who lived in Londonderry, Ireland). At an early age he sang as a choir boy at St. Georges's Episcopal Church in Belfast and as a soloist at Dr. Gray's Church at College Square in East Belfast. His love of music was one reason he decided to come to the US and continue his singing career. It is likely he came to Utica, NY because his brother, William C. Stewart (1847-1929), already lived there, but probably wouldn't have been the first choice of a immigrant looking to become a professional performer. In Utica, he was a founding member of the highly celebrated Hatton Quartette. They toured throughout the Mohawk Valley. I guess they would be what we would call a "Barbershop Quartet". Which have become much more popular lately. Funny how styles of music come back in vogue over time. Elliott H. Stewart was first tenor, Edwin A Ballou was second tenor, Charles A Winslow was first bass, and Walter Malacrow was second bass. The Hatton Quartette was formed in 1891 and continued until the late 1890s. Part of the group, including Elliott H. Stewart then formed the "Oriental Quartettte", so named not because of the ethnic background of any of their members, but because of the fact that they were associated with the Oriental Masonic Lodge. They continued together through at least the early 1900s. They performed at many local events and won numerous competitions. When the quartette eventually broke up, he continued as a celebrated singer. He was a frequent soloist at wedding, funerals and other events. Near the end of his life, he was musical director for the Church of the Blessed Sacrament. On October 15, 1895, he married the love of his life, Caroline "Carrie" Reath. My wife's great grand aunt. They had two children together: Elliott Andrew Stewart and Bessie M Stewart. Music was a passion Elliott instilled in his two children. Elliott Andrew Stewart was born June 25, 1898 in Utica, NY. He pursued the profession as a professional singer. He made performed on Broadway Operetta productions of "Desert Song", "New Moon", and "Student Prince". He performed frequently on the radio in the 1920 and 1930 and must have been quite a celebrity. You have to remember that this is before television and radio was a big deal. He traveled widely with his musical career touring in Chicago and across Canada. I don't have the story of how he met his wife Elizabeth Duffy, but they wed in Cleveland Heights, Ohio on August 26, 1939. He was 41 and his wife 39 years old. His family must have begun to believe that he was going to be married to his work and be a bachelor for life at the time he eventually married. Later that year, he and his wife, returned to Utica, NY and he joined the AM Radio station WIBX. By 1948, he was the station manager. He and his wife were very active in the Utican community and participated in many charities and civic organizations. But he never missed a chance to sing when the situations allowed it. Elizabeth Duffy Stewart passed away on November 6, 1962. According to her obituary, Elizabeth had worked as a fashion coordinator at Paramount Pictures in Hollywood and an advertising executive in Boston. At a time where most women didn't work outside the home, this was very impressive. Elliott died on December 26, 1966 on a Christmas time trip to New York City. He and his wife didn't have any children. Elliot H. and Caroline Stewart's daughter, Bessie, was also a music lover and accomplished musician. Bessie was born in Utica on July 31, 1896. She married George Bannigan on June 21, 1922 at St. Francis de Sales Church in Utica. Bessie studied music and the Utica Conservatory of Music. She was an accomplished pianist and started giving lessons to the neighborhood kids when she was only 14. Also, she furthered her piano studies in New York City with Pierre Luboschultz of the renowned piano team of Luboschultz and Nemenoff. When she returned to Utica, she made three appearances with the Utica Civic Orchestra. What she will be most widely remembered for is the impact she had on a wide number of her piano students over the years. Upon her death on August 31, 1951 a scholarship was created in her honor by the Utica B Sharp Club. She and her husband didn't have any children. The Stewarts were an exceptionally talented family. It is a shame that they don't have any family here to carry on their love of music. While the Stewart family of Utica does not endure, they live on in the many lives they touched and the people they introduced to a love of music. Noah Fuller was my 5th great grandfather. He was born in Salem, Massachusetts in 1712. He moved from Salem to Lebanon, CT probably between 174-1750. He was then one of the original "New England Planter" settlers to Horton, Nova Scotia. Here is a copy of his will which was proved on September 16, 1774. Oh, and please don't judge me on the lack of punctuation and poor spelling. The run on sentences are from the original document. Also, I give to my son Noah my first division dike lot. Some may wonder why I have been posting so many wills to my blog. I find them a good source of information and many of them don't seem to exist anywhere else. Just another great document to add to your genealogy research that I wanted to share with all my relatives: known and unknown. David Godfrey of Chatham, Mass and Horton, Nova Scotia is my 6th great grandfather. I have been looking for David Godfrey's will for some time. It was not where it was supposed to be. I reviewed the Will Book of probate records from Kings County, Nova Scotia, which is where he died, but no sign of his will. I contacted the Kings County Probate Court and they couldn't find a copy, either. I had nearly given up, but I had found the Genealogical Society of Nova Scotia website. The website didn't have a copy of David Godfrey's, but they did have a section which helped you connect with other people with similar research interests. It so happens that I connected with Bill Kennedy who had a copy of the will and had used it as a critical document to help him write the article David Godfrey of Chatham, Mass., and Horton, Kings Co., Nova Scotia, which appeared in the October 1991 edition of American Genealogist. In the article it identified that David Godfrey's will was to be found in the earliest Hants County, NS will book on p. 44. Since I always want to have a physical copy of the documents, I requested a copy of the will book through my local LDS Family Research Center. Special thanks to Bill Kennedy to sharing his great research with me and informing me of where I could find a copy of the original will information. 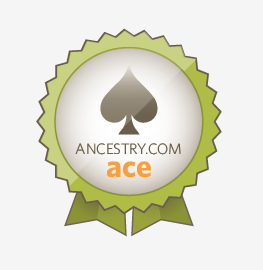 One of the best things about researching family history is the people that you connect with that are willing to help you in your research. Sometimes reading some historical documents about my ancestors, I get a feeling like it could be an 18th century version of Jerry Springer. The record of Elizabeth Fuller's assault on Judah Treche is one of those instances. Elizabeth Fuller was the wife of Timothy Fuller, my 4th great grand uncle. She was charged with beating Judah Treche with a stick. Here is the disposition of Judah Treche. It is unfortunate that the records of this event don't include any REASON why she beat Judah. Call my cynical, but I would expect that Elizabeth felt (real or imagined) that Judah had affection for or design on her husband Timothy Fuller. I can't think of another reason which would have caused her to react so violently without provocation on that day. It is interesting what you find, when you dig into the family history. This is my first post about my wife’s mother’s family. 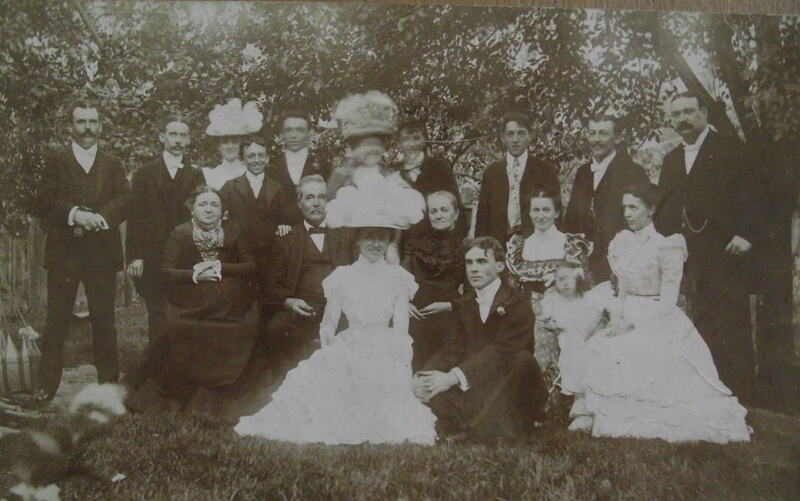 My mother-in-law found this great picture of her grandparent’s (Wallace Patrick Rogers and Margaret Reath) wedding from August 15, 1899. The photo included a listing of everyone’s names and I thought it would be interesting if I could identify each of the people from the picture and provide a little bio of each. John Rodgers (1871-1947) – Groom’s brother. John was a carpenter and worked with their father. In 1901, he married Catherine Gallagher. Together, they had 6 children: John F, Mary, Lulu, Agnes, Helen and Catherine. John Manly Jr – Usher. Friend of groom. Anna Reath (1880-1954) – Bridesmaid and sister of bride. In 1906, Anna married Thomas Smith. Thomas worked for the government and the IRS. The family relocated several times across the US. Together, they had one child: Mildred. Bill Reath – I don’t have any information on him. The bride had a brother named William Reath, but he would have been 17 at the time of the wedding and this person pictured does not appear to be 17. Frank Rodgers (1879-1945) – Best man and groom’s brother. In 1907, Frank married Emma Graneis. Frank was the owner of Rodgers Engraving. Together, they had one child: Francis P. Rodgers Jr.
Ella Rodgers (1882-1925) – Groom’s sister. She married Edward Crowe. Edward Crowe worked in a manufacturing plant in Utica. Together, they had two children: Edward and Roger. Louis Lanz – Cousin of the bride. Charlie Reath (1872-1939) – Brother of the bride. In 1897, he married Amelia Griffiths. He was a tailor. They had one child: Andrew Reath. Elliot Stewart (1866-unknown) – Brother-in-law of the bride. Elliot Stewart was from Ireland and had a fantastic singing voice. He sang at many family weddings and funerals. In 1895, he married Caroline Reath. They had two children: Bessie & Elliot Andrew Stewart. Ellen Stokes Rodgers (1844-1917) – Mother of the groom. Joseph Rodgers (1843-1914) – Father of the groom. He was a carpenter. In 1868, he married Ellen Stokes. They had 5 children: Joseph, John, Wallace, Frank, and Ella. Margaret Lanz Reath (1847-1932) – Mother of the bride. Margaret Lanz Reath was born in Bavaria, Germany and arrived with her father, mother and brothers to the US in 1867. She married Andrew Reath, who was born in Wurzburg, Bavaria. He died in 1895. They had 7 children: Andrew J, Caroline, Charles, Margaret, Joseph, Anna and William. Caroline Reath Stewart (1870-unknown) – Sister of the bride. Married to Elliot Stewart. Bessie Stewart (1896 – unknown). Niece of the bride. Daughter of Elliot Stewart and Caroline Reath Stewart. She was about 3 or 4 years old at the time of the wedding. Millie Reath – Unknown. From what I can tell she is not a sister of the bride and not a sister-in-law. A mystery. Margaret Reath Rodgers (1874-1957) – Bride. Born and raised in Utica. She and Wallace Patrick Rodgers had two children: Marguerite Rodgers Williams (1901-1979) and Dorothy Rodgers Purcell (1907-1990). Wallace Patrick Rodgers (1876-1947) – Groom. Wallace worked as a photo engraver for over 50 years. In the early part of his career he worked for the Utica Saturday Globe newspaper and then worked with his brother Frank at Rodgers Photo Engraving.